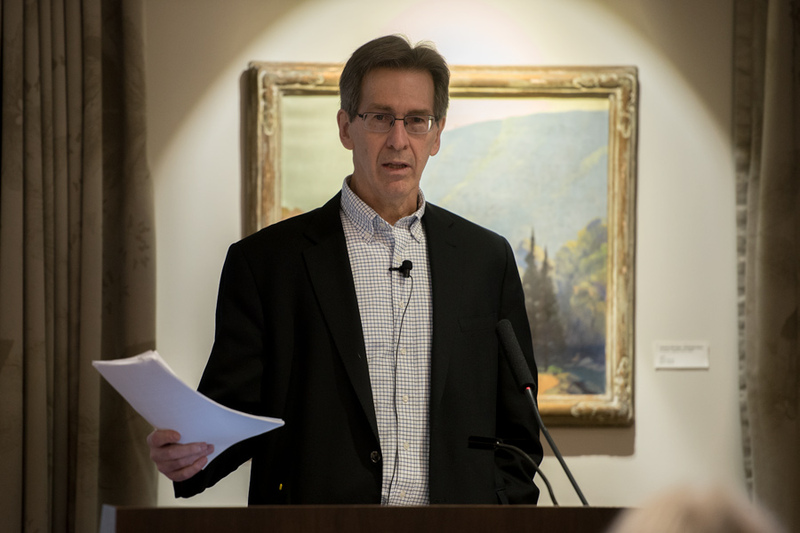 Communication Prof. Robert Hariman speaks during Wednesday’s Faculty Senate. At the meeting, Senate voted to support non-tenure eligible faculty. Faculty Senate voted during its Wednesday meeting to support non-tenure eligible faculty without getting involved in unionization efforts, after a contentious debate regarding an amendment that would recommend Senate enter unionization negotiations. NTE Committee head Elsa Alvaro presented the resolution, which called for Senate to affirm its support of NTE faculty members and their rights as employees of Northwestern. She said NTE faculty make up a large and integral component of NU, and they deserve representation and support from their peers. However, Alvaro recommended that Senate leave the process of unionization to the National Labor Relations Board, which she said her committee viewed as a more appropriate body to work on this issue. NTE faculty originally filed for an election to join Service Employees International Union in June 2016. SEIU challenged 25 of the ballots, and majority support for the union was not confirmed until May 2017. NTE faculty filed unfair labor practice charges against NU in September because the University, citing the fact that some ballots remained uncounted, refused to bargain with them. The resolution was first placed under the NTE Committee for review in November after the history department suggested a proposal for Senate to get involved in unionization efforts. The NTE Committee changed the resolution to offer support for NTE faculty without getting involved in unionization, then unanimously approved it. Alvaro added that her committee — which is made up entirely of NTE faculty members — had done extensive research to determine that their proposed motion was the correct one for NTE faculty at NU. However, at Wednesday’s Senate meeting, French Prof. Jane Winston presented an amendment to Alvaro’s motion that she said was voted on by the French and Italian departments. The amendment recommended that Senate call on the University to accept any future rulings of the NLRB and enter negotiations with the union. Many of the members who were considering supporting the amendment said they were influenced by NTE faculty members within their departments. But most Senate members suggested the amendment would alter the main focus of the resolution. English Prof. Barbara Newman said the amendment ignored the fact that the NLRB has been actively reviewing the NTE faculty’s decision to unionize, and that it was naïve to assume that Senate had the power to change the current situation. “I agree with the NTE Committee’s resolution that the Faculty Senate cannot reverse a contested election, one that has been contested for almost two years,” Newman said. When the Senate moved to final voting, the majority of the members voted for the memo and against the amendment, ensuring that Alvaro’s motion to have the Senate support the rights of NTE Faculty without becoming involved in unionization efforts would be put into effect. Although anthropology Prof. Micaela di Leonardo supported the failed amendment to become involved in unionization efforts, she said she respected the work put into the approved resolution.